Description: Billy wears a grey sleeveless shirt adorned with dark blue spots, dark blue trousers with some tears on them, a black belt around his waist and brown shoes. He has red hair and eye brows and black eyes. He has some asymmetric details, including belts around his torso, a wristband (right arm), a glove (left arm), a shoulder patch (left arm) and a backpack with a hole in it so the glider can be attached to the figure: all this detailing is coloured black. Most notably, his left arm can move differently from the average human figure, not only forward and backward, but also up and down. The figure stands in an odd position with its legs wide apart and appears to be looking down. The glider is coloured black, covered in various light blue spots and shapes on both sides, revealing a yellow frame work around the edges. It basically resembles a large triangle. Billy can carry it on his back, so it appears he's hanging onto it. The Pteranodon is positioned with its claws open and its head looking to the right, the left wing raised significantly upwards compared to its right wing. It's mostly coloured light yellow, while the back, most of the legs and feet, the arms and the fingers, the neck and most of the head are painted orange. On their top side the wings feature several brown stripes. The beak is painted brown, except for a triangular area around the nostrils which is pink instead. The figure sports two small brown bands around its head crest. The Pterosaur has small black eyes, a pink tongue and a black JP logo on the underside of its left wing. Analysis: apart from Alan Grant, the only other actual character from any of the JP movies to reappear in JP 2009 is Billy Brennan. As before, he comes with a hang glider (inspired by the para-sailing scene from Jurassic Park III no doubt) and a left arm that has additional poseability options compared to the other human figures produced by Hasbro. His paint job is quite close to the one used on the original JP III Billy figure (though he's a red head now), except a little darker and more detailed. He looks pretty gritty and tough, as does his hang glider, which features a radically new and detailed paint job compared to its previous incarnations. At least it looks good this time, even though its actual use is still limited: Billy can carry it on his back and pose his arms like he's flying with it, but it looks totally unrealistic and rather goofy. Repaint: yes. This set is identical to the Billy Brennan set of the JP III line (Wave 1). 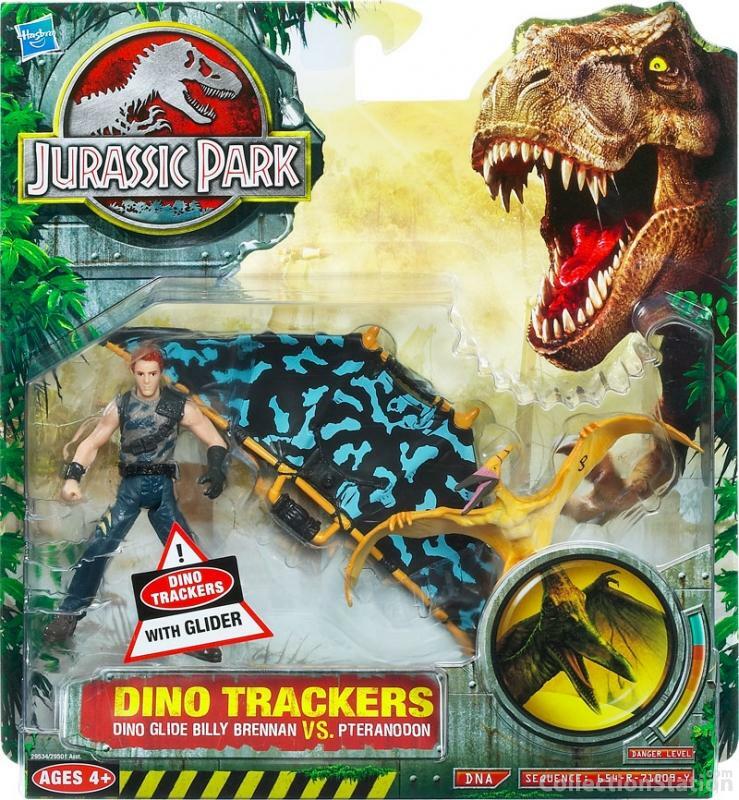 Billy himself has been repainted once before for JPD2 (along with his hang glider). The Pteranodon is a first time (and until so far, last time) repaint though. Overall rating: 6/10. Billy remains a fairly good sculpt, though not overly originally repainted. While the hang glider is a bit of a silly thing, it features a splendid new paint scheme. The little Pteranodon has a less appealing paint job, but it's nice to see this sculpt again for a change. Otherwise there's nothing new to be found here. This set is not rare and can still be found with little effort. Since this set was a Toys'R'Us exclusive that might change eventually, but probably not for the next decade.